POWER WVA: attach the Digi WVA to the vehicle diagnostic port. 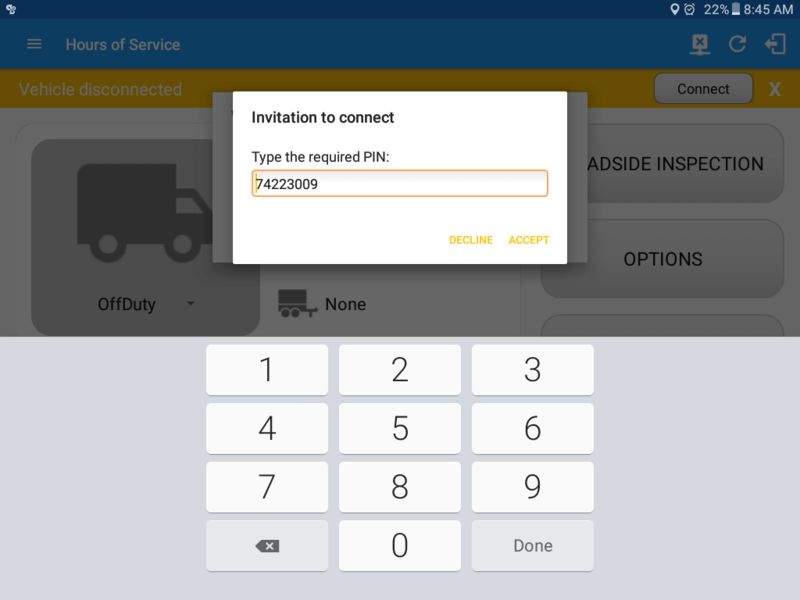 NOTE: This step is only to be followed if the device has never been setup, or the device is being changed from Push Button pairing to PIN pairing mode or vice-versa. 1. Press the WVA button on the device and hold it down for at least 10 seconds. 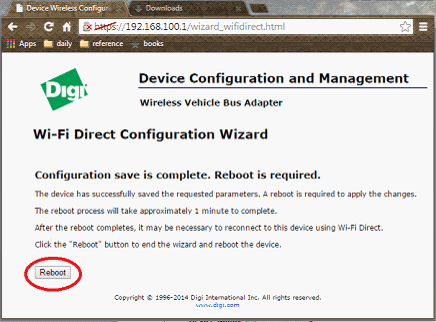 This will reset the device to its original factory settings and is necessary for initial configuration of Wi-Fi Direct. 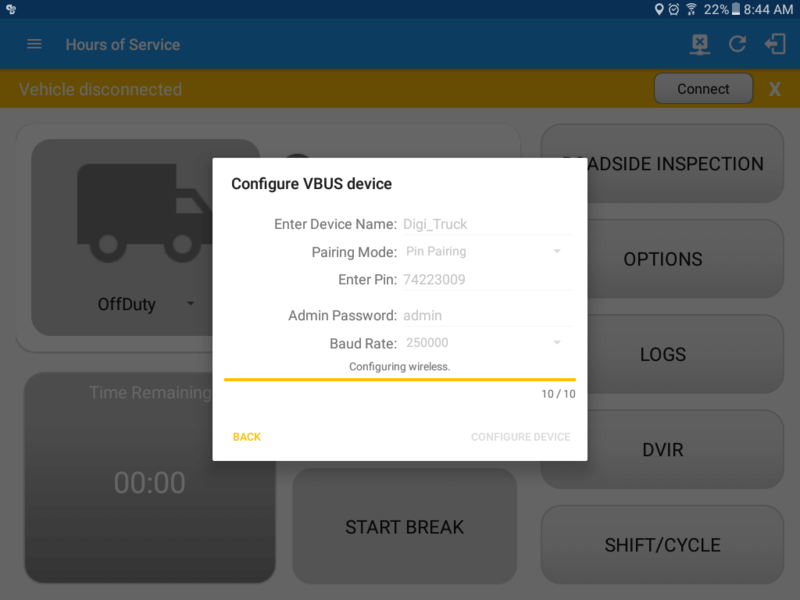 The ‘Configure VBUS device’ dialog will be displayed. 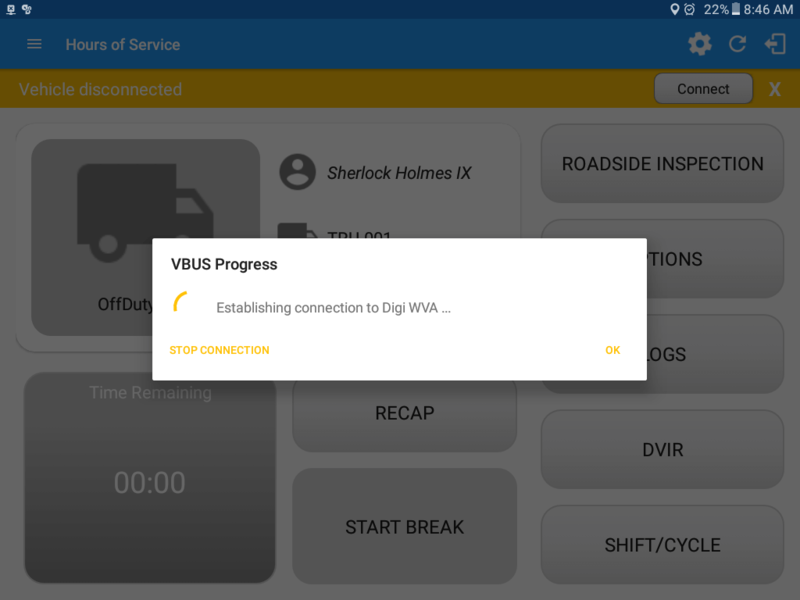 At this point, there are two ways to connect to the Digi WVA device; the first time the Digi is being configured, or connecting to an already configured device. To connect for the first time, follow the steps below starting at step 6. 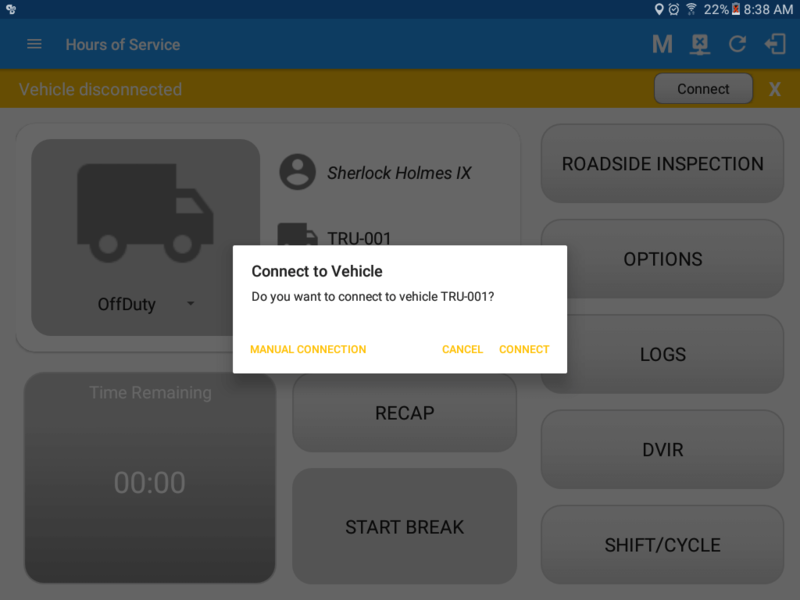 If the device is already configured, then start the connection on step 7. 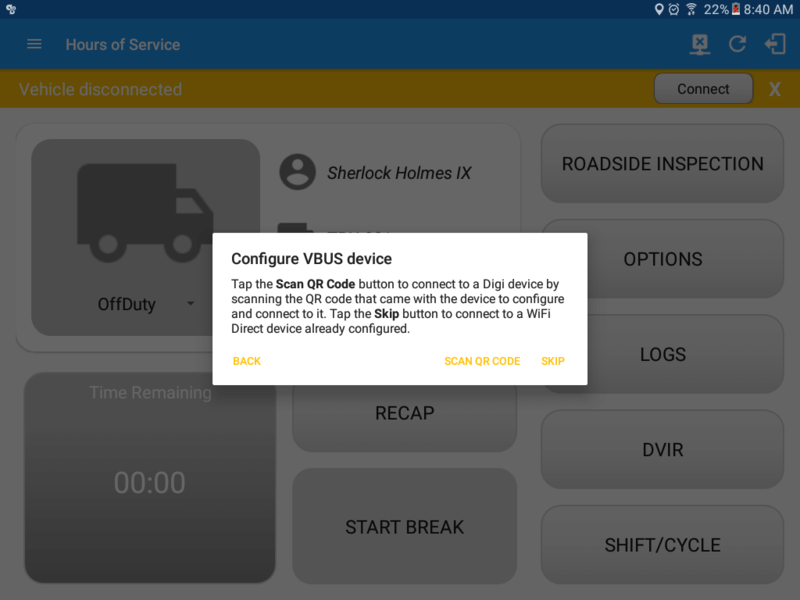 Configure Digi VBUS device screen will then display. 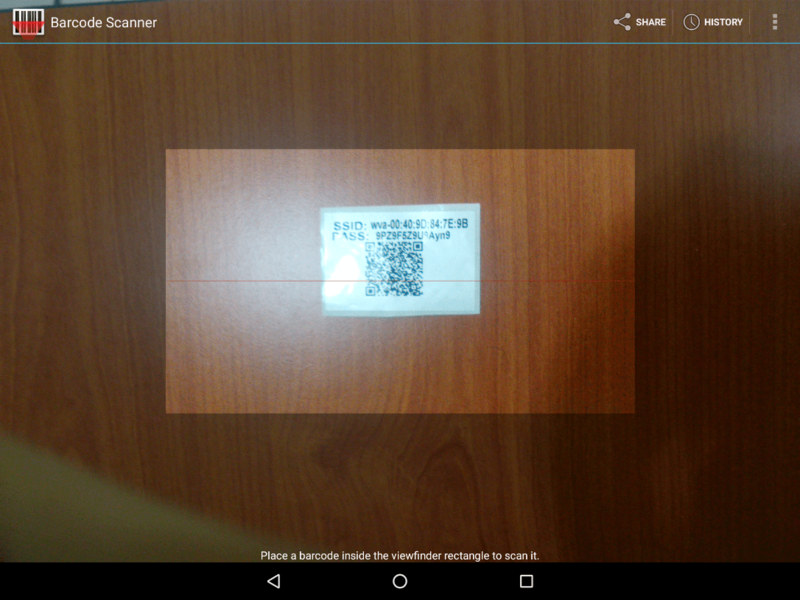 Connect to Digi device by scanning QR code. d) If the scanning of QR code is successful, then Digi WVA Configuration screen will then be displayed. 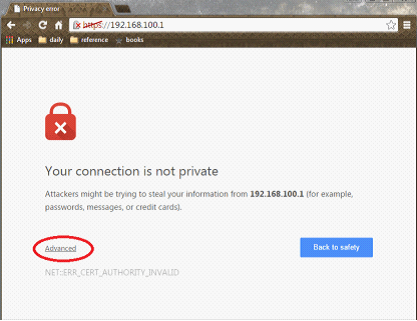 ⇒ If an error was encountered during configuration process then an Error dialog will be displayed. 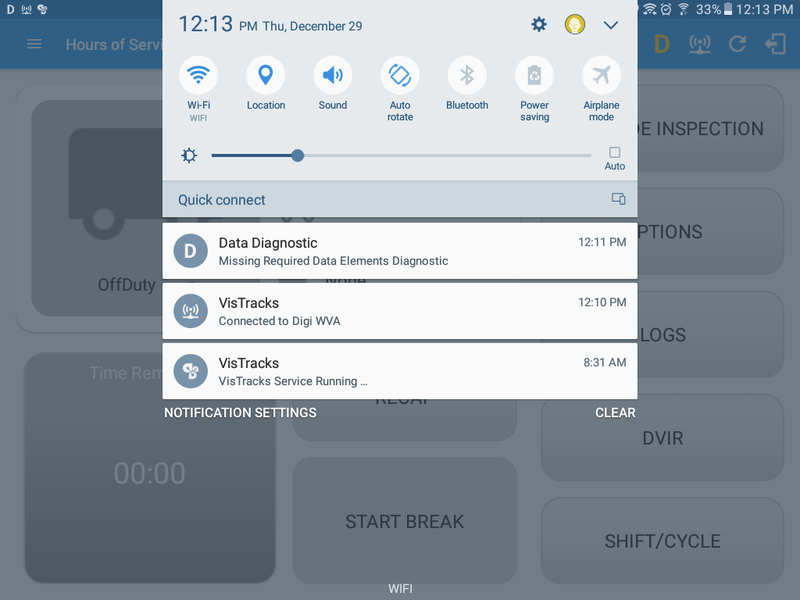 A dialog will then display the asking if you want to connect to the Digi WVA device. 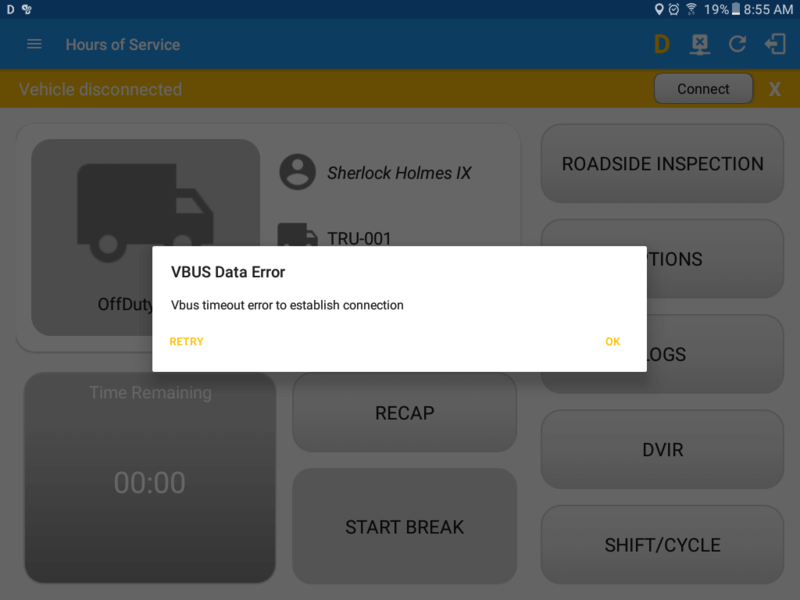 ⇒ If the VBUS connection results to an error (given the following situations below), an error dialog will display. 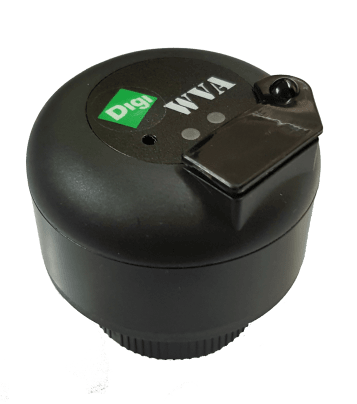 Hold the Digi WVA button down for 3 seconds (do not hold down for more than 3 seconds or you will have to repeat the entire process). 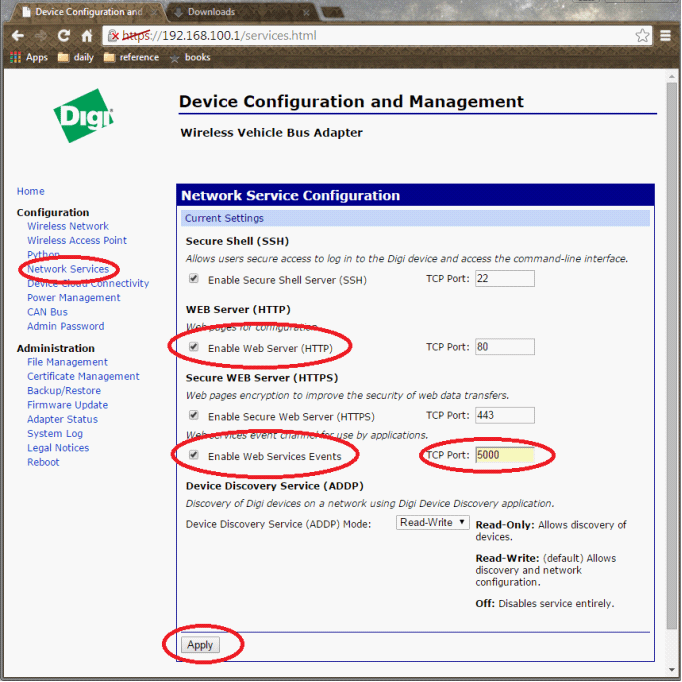 Note: If this did not work please follow the below manual setup method to connect to the Digi WVA in Wi-Fi direct mode. 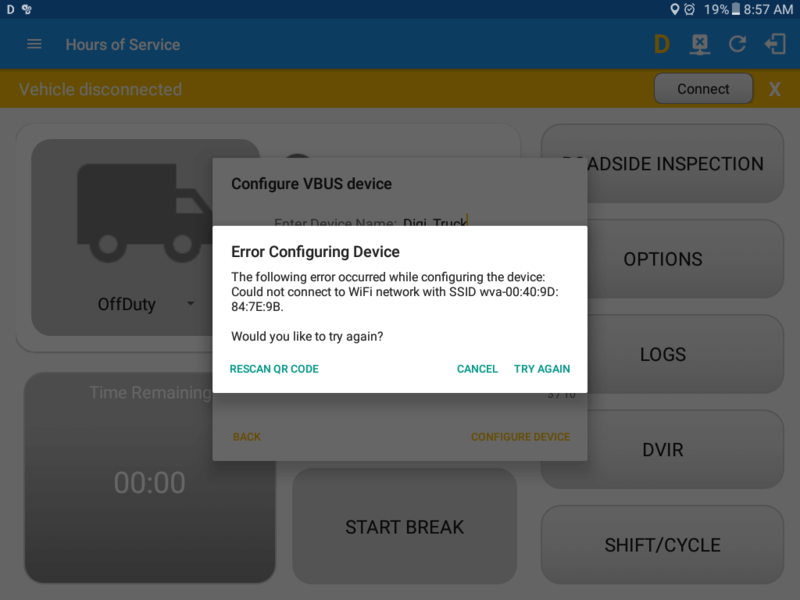 Prior to following the manual setup method you will need to press the WVA button on the device and hold it down for at least 10 seconds in order to reset the device to its original factory settings. 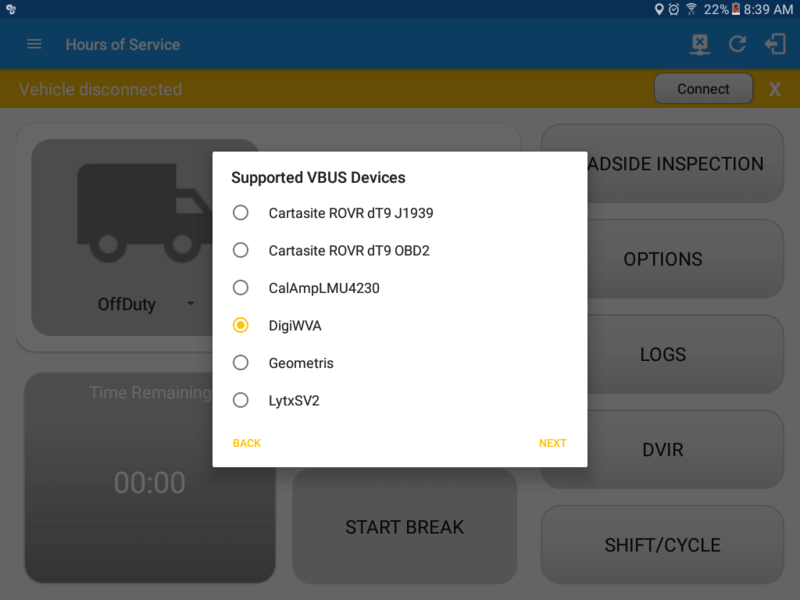 a) For a Digi WVA device configured for PIN Pairing mode. 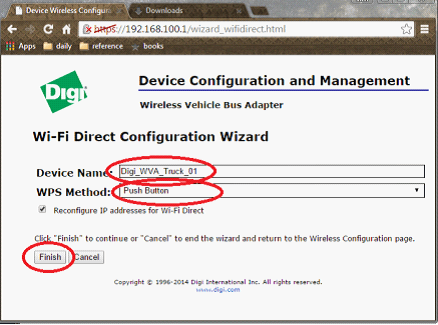 b) For a Digi WVA device configured for Push Button pairing. 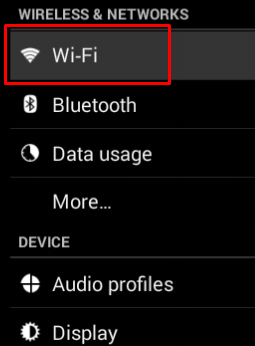 Go to the wireless connections on your computer. 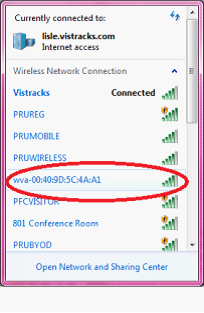 The WVA will announce itself as a hot spot wireless network using the naming convention of wva-mac-address. 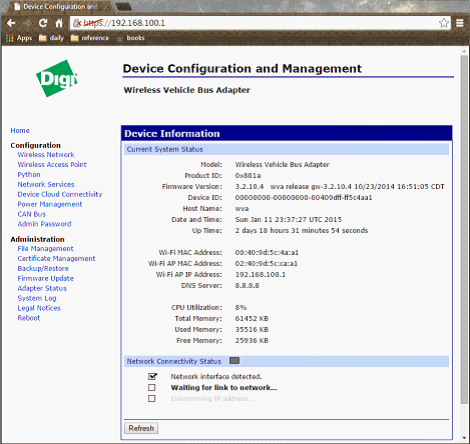 User is at the device configuration homepage. 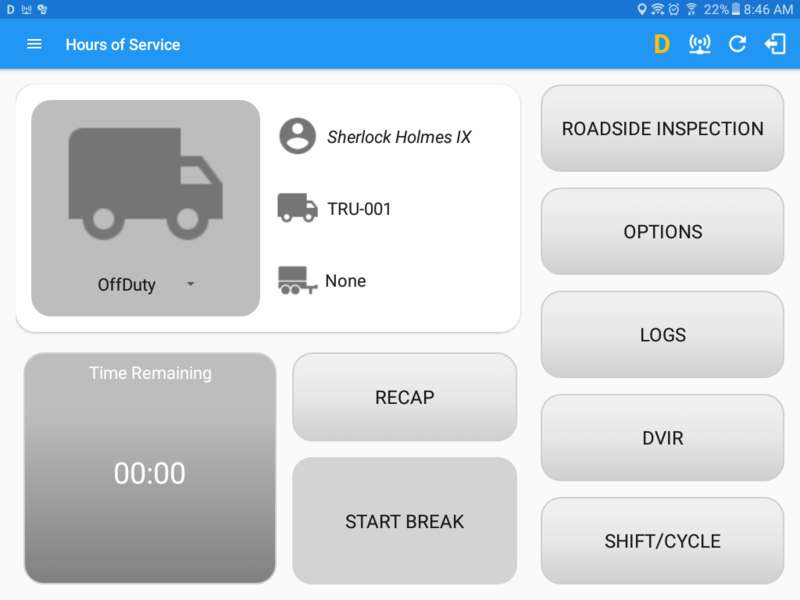 If the values still do not change proceed to the section below for ‘Change CAN Bus Configuration’. 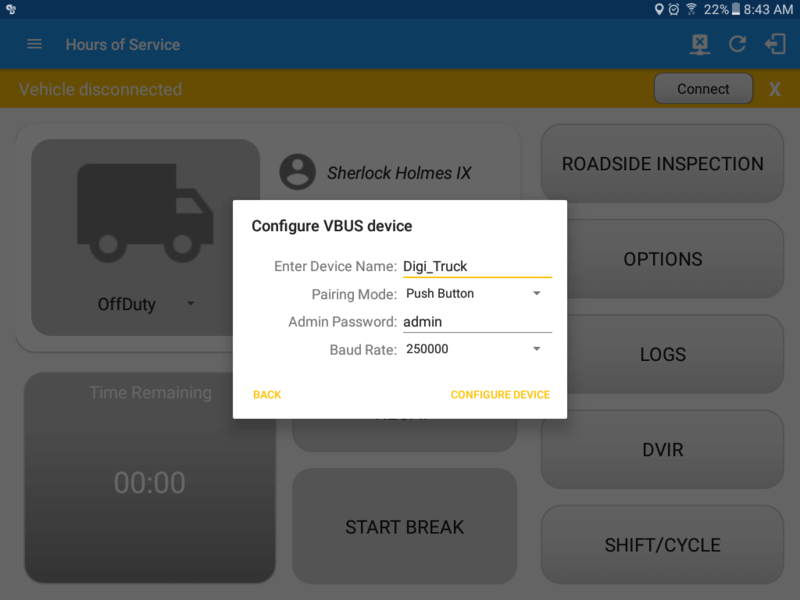 Else if you see values skip to the section titled ‘Configure the WVA for Wi-Fi Direct’. 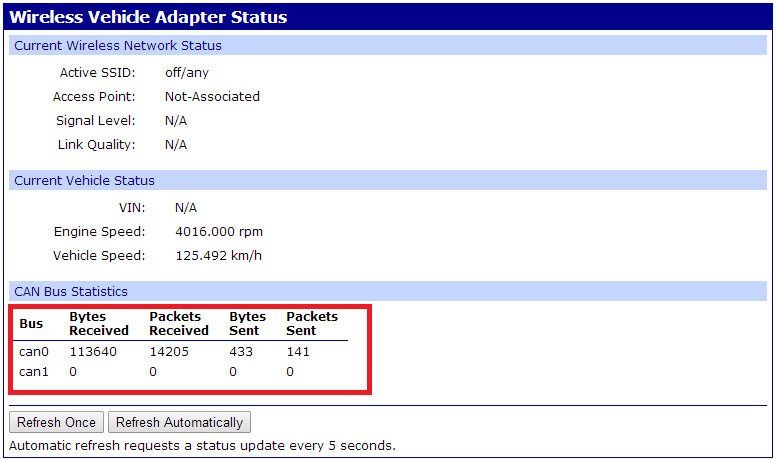 Click Network Services tab to get to Network Service Configuration screen. 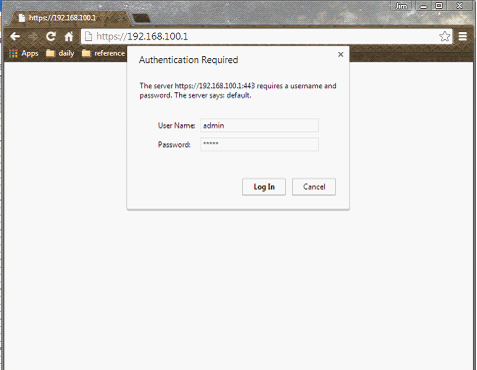 Enter in a Device Name. 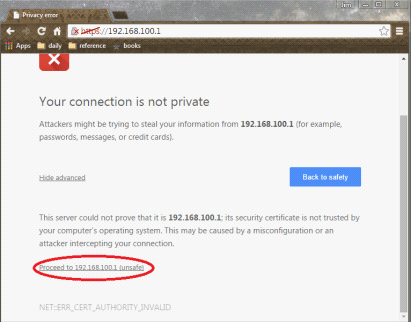 The name must contain the contiguous text “Digi_WVA”. 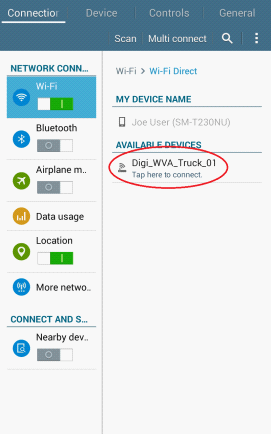 You can also add the vehicle number associated with the device as in the example below where “Digi_WVA_Truck_01” was entered. A VIN # as part of the name may be a great choice as well. Select Push Button for the WPS Method and click the Finish button. User will be asked to reboot. User must reboot in order to complete the install. Tap on the WVA Wi-Fi Direct network and immediately afterwards press the button on the WVA device for 3 seconds. Do not press the button any longer than ten seconds as this will reset the device and user will have to start over. 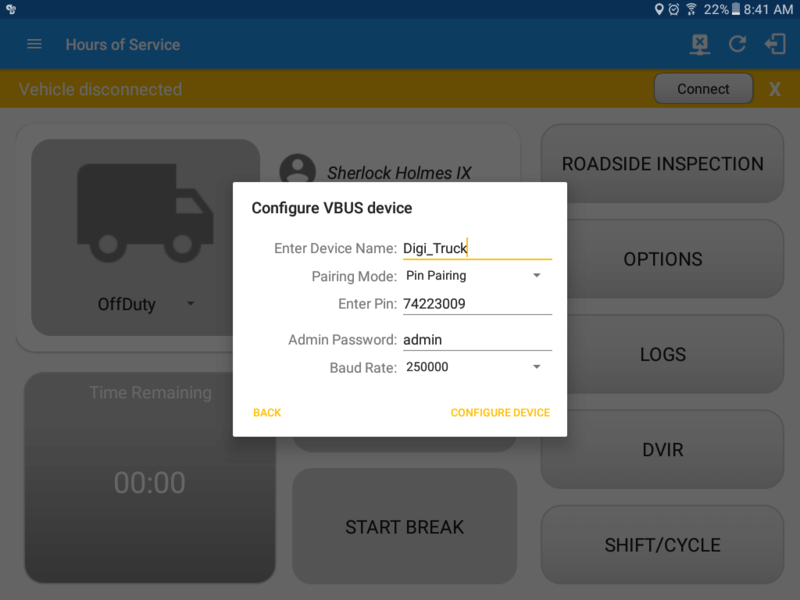 Once the initial pairing is complete the device is ready for use with the VisTracks android application. 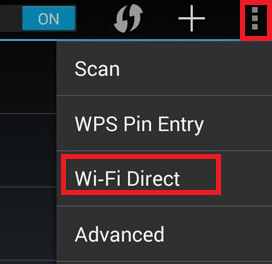 You have the option to scan the QR code that came with your device or connect to it yourself via Wifi-Direct. 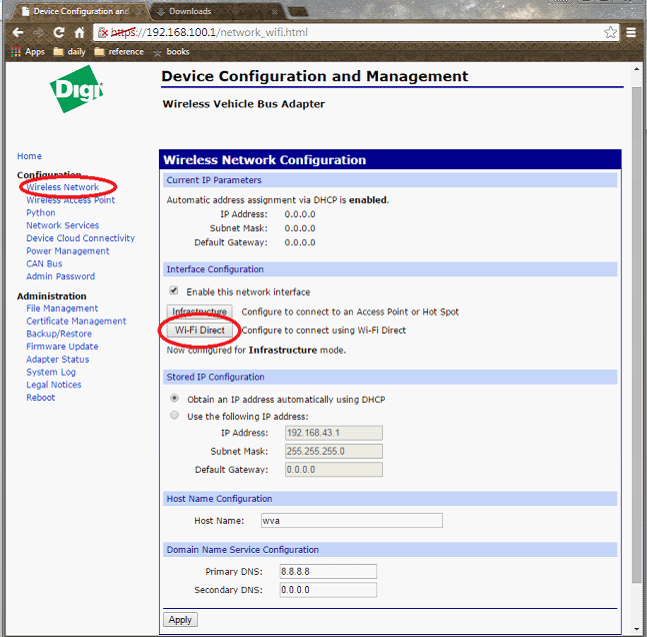 In this example, we will be connecting via Wi-Fi Direct device already configured. 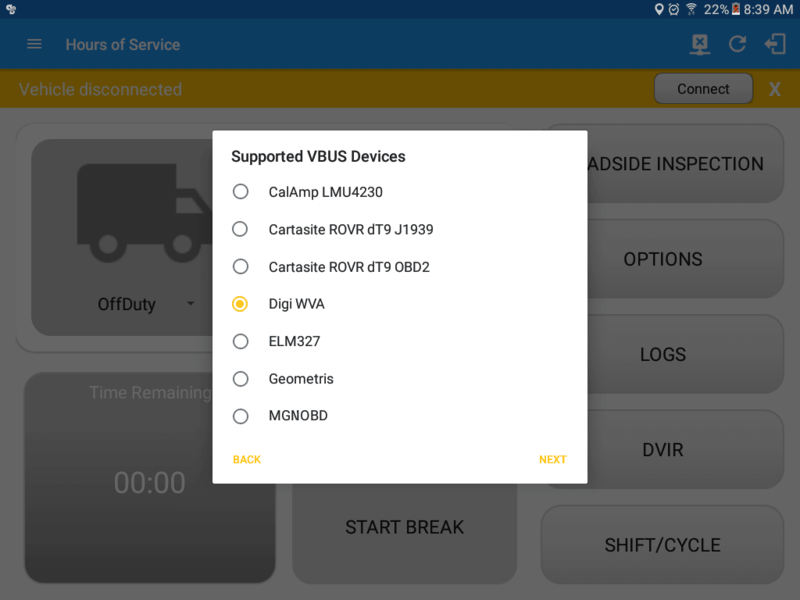 Tap “Select Device” Button. You should hear a tone letting you know that device is now connected.